Dedicate a day to two of the world's greatest art museums: the Accademia and Uffizi galleries in Florence. With a bounty of Italian art, the galleries boast masterpieces at every turn. Make sure you don't miss out on the highlights and hear little-known stories behind works such as Michelangelo's David and Sandro Botticelli's Birth of Venus. 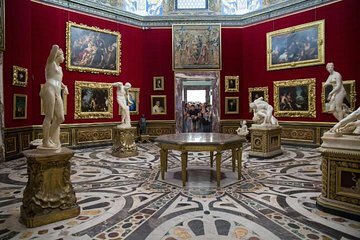 The day-long experience includes skip-the-line entry, a morning tour of the Accademia Gallery, a break for lunch, and an afternoon tour of the Uffizi Gallery. Enjoyed the tour and our guide was informative, guiding the group well through the crowds. Great way to see two iconic museums and key artworks, learn about art and history, and see beautiful architecture! Went in mid-May and it was busy on the day, so waited half an hour in line. Well organised. The guides were most professional. They knew the subject and were free to answer extra questions about both Academia and the Uffizi. Everything was organized. My wife and I were not at all disappointed from start till end. This is an amazing tour . It is very convenient to be able to skip the queues and also have a tour led by such knowledgeable guides. The only downside it that no headphones were provided during the David tour and this detracted a little from the experience. It was most probably an exception though for our tour. The David is an amazing sight! And the Bottecelli's are a sight for sore eyes! Valentina was our guide for the Uffizi Gallery, and she was exceptional! We learned so much, and we were so impressed with her knowledge and enthusiasm!! I like the split format allowing us to have some free time between segments.